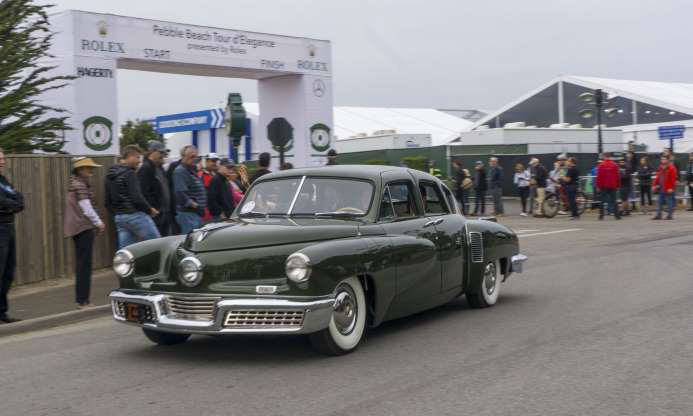 Tucker 1015 and Tucker 1044 were two of the five Tuckers that participated in 2018 Pebble Beach Tour d'Elegance. Tucker 1015 (seen here) is owned by Mary and Ted Stahl of Chesterfield, Michigan. Like Tucker 1044, it has been repainted in its original Andante Green. Tucker 1044 at the start of the Tour with its set of ''tour" whitewalls. The primary exterior differences with Tucker 1015 are the license plates and the location of the gas tank cover (on the front fender of Tucker 1044 and under the rear vent of Tucker 1015). Tucker 1015 started the Tour with the first group of automobiles. Thirty minutes later, Tucker 1044 began the Tour. 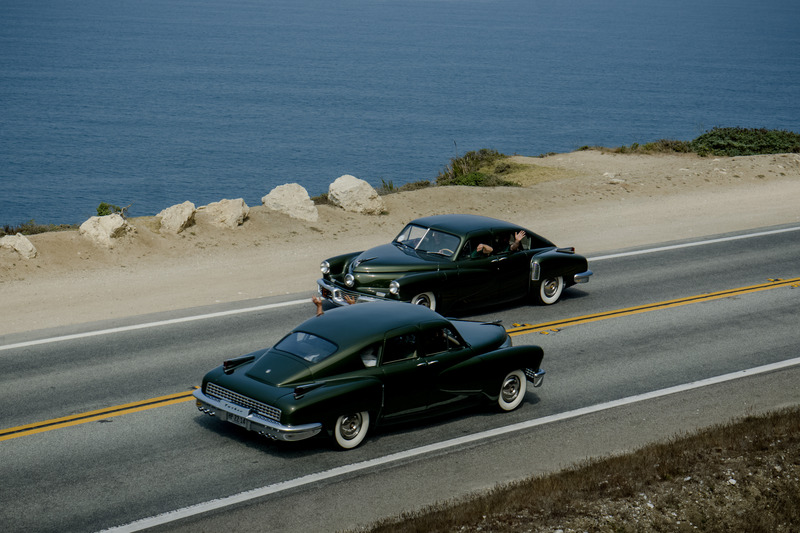 Approximately 35 miles into the Tour in Big Sur (5 miles from the turn-around at Ripplewood Resort), the two Andante Green Tuckers passed each other. This photo taken from Tucker 1015 captured the excitement in our automobile when we saw our "sister" Tucker. Rob Ida and Sean Tucker are waving, while Mike Tucker and I were yelling "Tucker, Tucker!!!" Courtesy of the Stahl Automotive Foundation. Photographer Leo Mayorquim set up his Sony Alpha 6000 camera at this location to document the Tour. 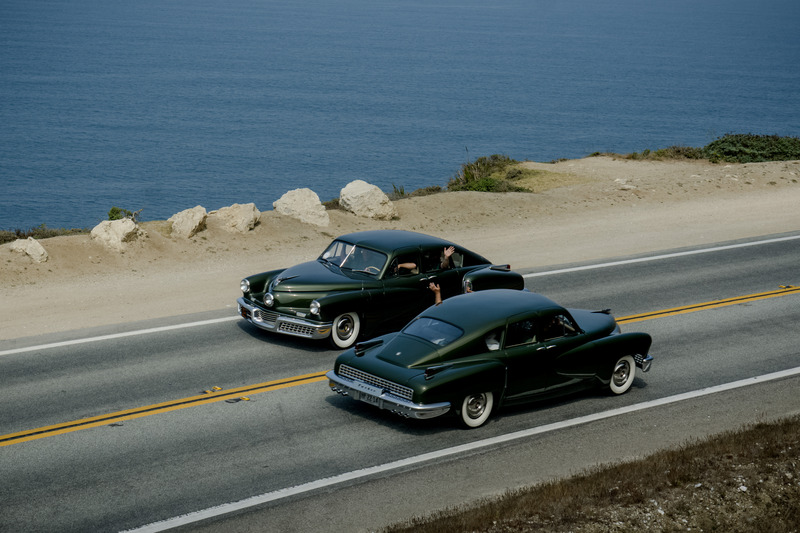 He captured these historic photos of two Tuckers passing each other on a road. Leo Mayorquim: "I climbed the side of the hill about 40 feet up and just panned as I took still images. I got super lucky." High-resolution photos of these historic Tucker photos can be obtained from Leo at leo@cncpics.com . That's me in the front passenger seat saluting Tucker 1015. 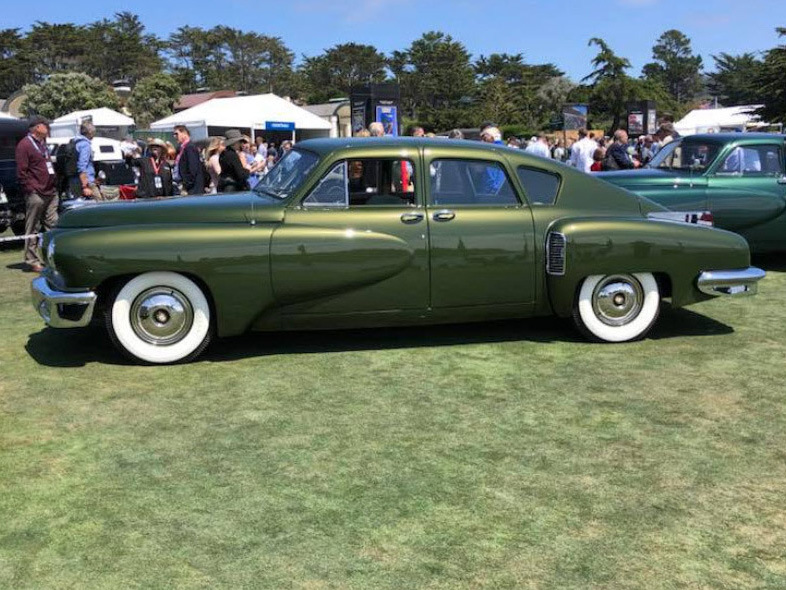 These photos captured the friendship and joy experienced among the Tucker owners and Tucker Family at at both the Tour and Concours. “Captured the friendship and joy” perfect words to describe how you felt Howard, and how proud we all are of you and Roz and your Tucker ! 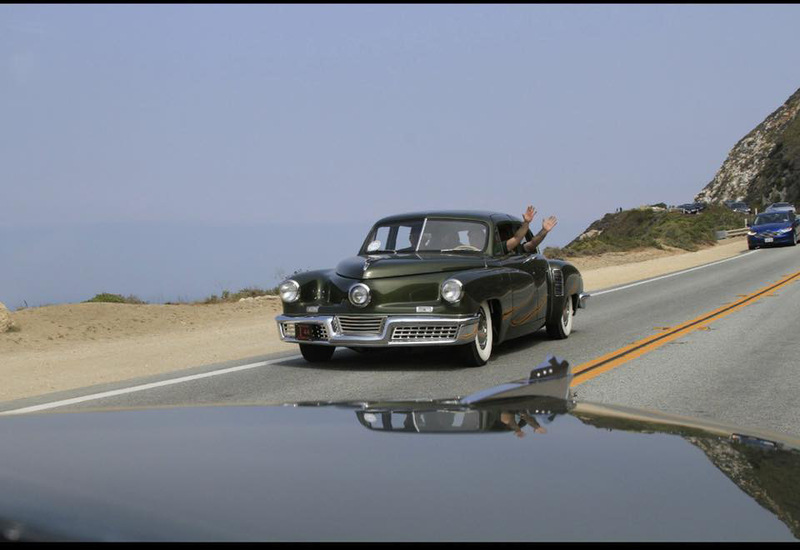 Question, how many shake down miles did you put on the Tucker before shipping it to the west coast…? How many total miles are on it since the resto? We logged about 8 miles in New Jersey after the restoration completion. 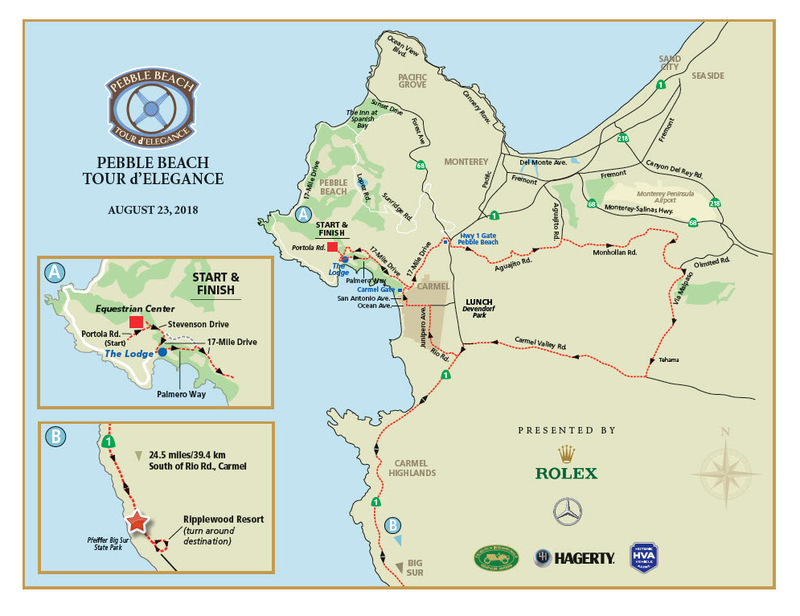 Including the Pebble Beach Tour d’Elegance, we have added about 95 miles. I’d love to hear about the ride experience of a fully revived Tucker when you get a moment…Maybe even do a video and on board discussion . Ted, Tucker 1044 has two sets of wheels. 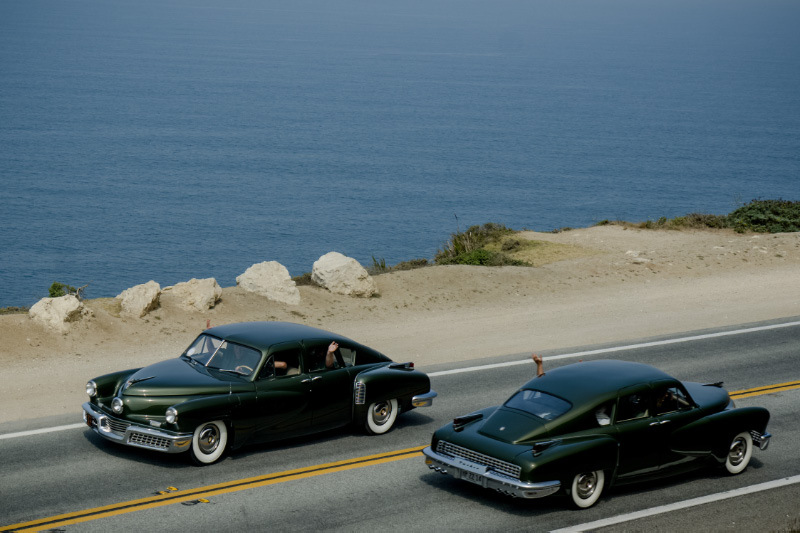 We used the whitewalls for the Tour and the factory-correct blackwalls for the Concours. The judges recommended that Tucker 1044 should always be shown in blackwalls. Clearly, at Pebble Beach, the Force was with George Lucas’ Tucker 1009. Must be really a great experience to see and be a part of the resto and exhibition. And not to forget, the driving/riding in a historical piece. Thanks Howard. How’s John doing?Say hi to him for me,thanks again.